Accepted Scientific Name: Pereskia grandifolia Haw. Suppl. Pl. Succ. 85 (-86). 1819 Haw. Origin and Habitat: Brazil (Southern America from southernmost Ceará, Pernambuco (native and cultivated), central-eastern and south-eastern Bahia to southern Espírito Santo and south-western Minas Gerais. Perhaps it is also native to Rio de Janeiro and São Paulo. It is widely cultivated and ranges south to Santa Catarina and southeastern Mato Grosso. It is commonly introduced in the Neotropics. The natural range of this Pereskia grandifolia remains poorly known, probably through early destruction of its habitat and for the uncertainty as to its native status caused by its widespread introduction as a cultivated ornamental. Habitat and Ecology: This is a humid/subhumid evergreen forest element. The species is widespread and widely cultivated. There is widespread habitat loss due to logging, expansion of urban areas and clearance of forest for agricultural expansion. Pereskia grandiflora hort. ex Pfeiff. 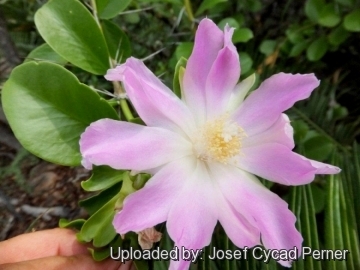 Pereskia rosea hort. ex A.Dietr. Cactaceae Consensus Init. 3: 7 7 1997. Pereskia grandifolia var. violacea Leuenb. Description: Pereskia grandifolia is an ever green to deciduous (depending on growing conditions) small tree or shrub, 2 to 5 m tall with a rounded crown. it is an example of a non-succulent primitive cactus. Two subspecies are recognized, the nominate form and subs. violacea. Stem: Its main stem is upright to arching and resembles a woody plant more than a cacti, sometime it form a very spiny woody greys-brown trunk up to 1 meter tall and 10-20 cm in diameter that bears numerous branches. Twigs quite vine-like, fleshy, glabrous and green. Areoles: White round with tiny hairs around the foliar nodes. Spines: 1 to 8 up to 4 cm long, very sharp, acicular arranged in clusters or spreading but usually absent on new growth. On the older stems and trunk the spine are more robust and numerous (Up to 90) and up to 6,5 cm long. 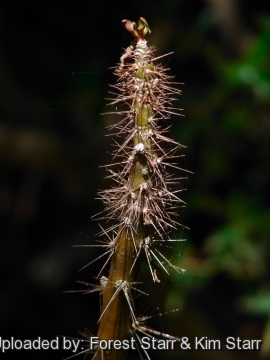 It is however quite variable, some plant have spines, but others have none at all. Leaves: Thick but fleshy, variable in size, elliptic to oblong lanceolate 5-15 cm long, somewhat pointed narrowing toward the base into a short petiole. Venation pinnate and prominent below. Flower: Very showy rose-like, 3-5 cm in diameter lasting for 2 days, sepals green, petals usually pink or purplish (but also white or tan) in short few flowered terminal panicles, centered by yellow stamens with red filaments, the stigma and style is white. Ovary bearing large leaves. Blooming season: Flowering is during warm months and fruit is born by the flowers. Fruit: 4-10 cm long, red, green or (usually) yellow coloured pear-shaped and more or less triangular. This fruit is a curious proliferating structure, bearing 3-4 cm long leaves, which ultimately fall away, looking more part of the stems than actual fruits. Several may seeded fruit are attached at a single peduncle. It smells good and is considered by some edible only at full ripening (otherwise it is very astringent). Pereskia grandifolia Haw. : (subs. grandifolia) with receptacle brats green and rarely curved and a pink flowers it is native to eastern Brazil but widely cultivated in the tropical Americas. 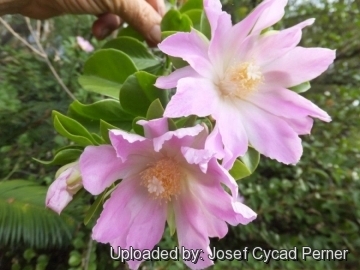 Pereskia grandifolia subs. violacea (Leuenb.) N.P.Taylor & Zappi: with purplish-pink or purple bracts and flowers. 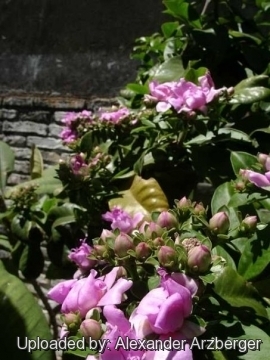 It was discovered sometime before 1972, initially described as Pereskia bahiensis, but is only distinguished from var. grandifolia by colour. It is apparently native to Espirito Santo and Minas Gerais. 8) Taylor, N.P., Zappi, D., Machado, M. & Braun, P. 2013. Pereskia grandifolia. The IUCN Red List of Threatened Species. Version 2014.2. <www.iucnredlist.org>. Downloaded on 03 August 2014. 9) Anonymous. 1986. List-Based Rec., Soil Conserv. Serv., U.S.D.A. Database of the U.S.D.A., Beltsville. 11) Forzza, R. C. & et al. 2010. 2010 “Lista de espécies Flora do Brasil.” http://floradobrasil.jbrj.gov.br/2010/. 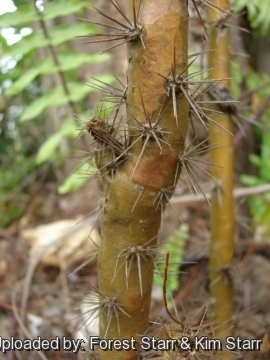 13) Molina Rosito, A.” Enumeración de las plantas de Honduras.” Ceiba 19(1): 1–118. 1975. 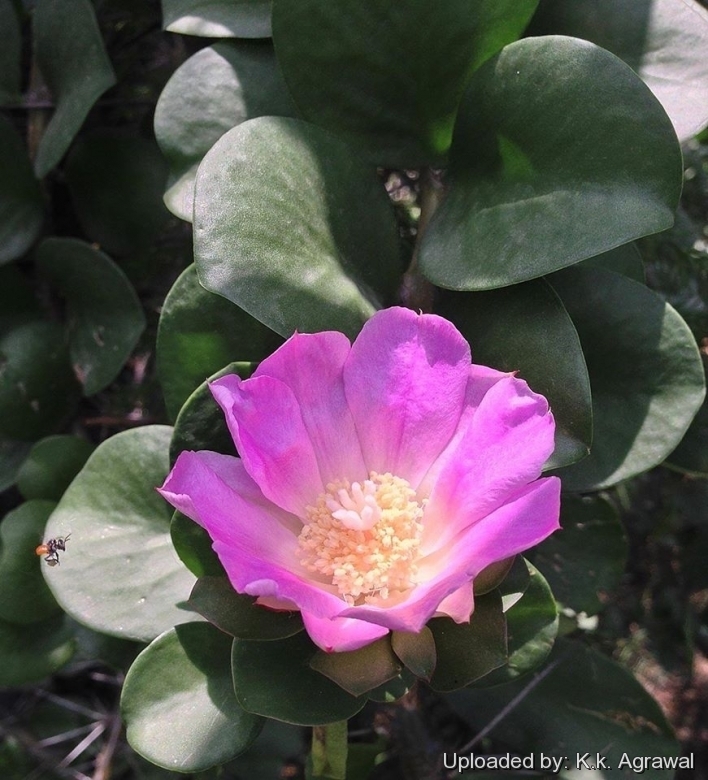 18) 1) Forest & Kim Starr “Pereskia grandifolia var. 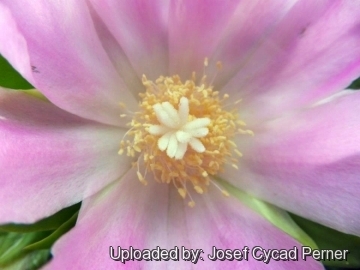 grandifolia (Pereskia, rose cactus)”. Plants of Hawaii. <http://www.starrenvironmental.com>. Downloaded on 20 August 2014. Cultivation and Propagation: Nearly indestructible, Pereskia grandifolia requires full sun or light shade (but withstand dense shade) and well drained soils, preferably rich neutral organic soils, but may tolerate acidic ones. Growing rate: It is a fast grower, and will quickly become large landscape masterpieces in just a few years. It is a long lived plant and once established, it will be content in its position and with its soil for years. Waterings: Water regularly during the active growing season from March to September. No water should ever be allowed to stand around the roots. Keep almost completely dry in winter. It is drought resistant, but leaves drop during drought. Hardiness: Considered frost tender, but surprisingly cold hardy outdoors and also very sun hardy for a succulent plant. It likes warmth (recommended minimum winter temperature 10° C) however plants kept perfectly dry can can survive low temperatures, approx. to -3°C., but for safe cultivation it is best to avoid freezing temperatures. Never let the roots chill. Deciduous below 4°C. Maintenance: Can be pruned for shape and branching. Plant Pests: Prone to mealy bugs and rarely scale. Uses: Often used for edges it is planted by pushing cutting into the ground, its spiny stem soon forming a capital barrier, sometimes grown as a climber, as a basket plant, or in the form. of a pyramid. The leaves are edible, and it is a popular vegetable in parts of the Brazilian state of Minas Gerais under the name of ora-pro-nóbis. The leaves are used in green salads, or can be cooked. In rural Brazil, the leaves, stems and fruits are also used for food for animals. Propagation: It's very easy to propagate from cuttings or seeds, contrarily to most other cacti, Pereskia cuttings should be planted immediately without a dry out period. (you can also let them sit in a jar of water).